whathifi.com gets a fresh new look | What Hi-Fi? 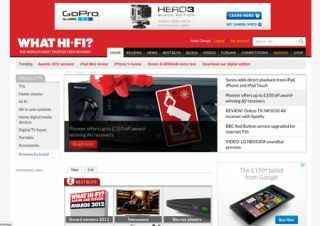 Welcome to the new-look whathifi.com. We’ve given the site a makeover with a new, simpler and fresher design. The functionality remains the same, but we’ve added a bigger Carousel and more videos to the Homepage, simplified the use of colours and adopted more modern typography. We've improved in-site search too, so it should be easier to find what you want. You’ll spot a new ‘trending’ bar at the top of the Homepage, a more prominent position for our latest videos and a simplified structure for our For and Against comments on all the reviews. We've also added social media buttons giving you quick links to our Facebook, Twitter, YouTube and Google+ pages so you can follow us wherever you are. And a link at the bottom of the Homepage takes you straight to iTunes where you can get our iPad app and download the digital edition of the mag directly to your tablet. Don’t forget you can also compare prices and check out the latest deals on the new whathifi.com shop, with ‘Buy Now’ and ‘Available from’ links on many reviews. The all-important Awards section and Best Buys remain, and we’ve no doubt you’ll let us know what you think of the new look on the Forums. We’ll be doing a bit more tweaking over the coming days, so bear with us while we do.